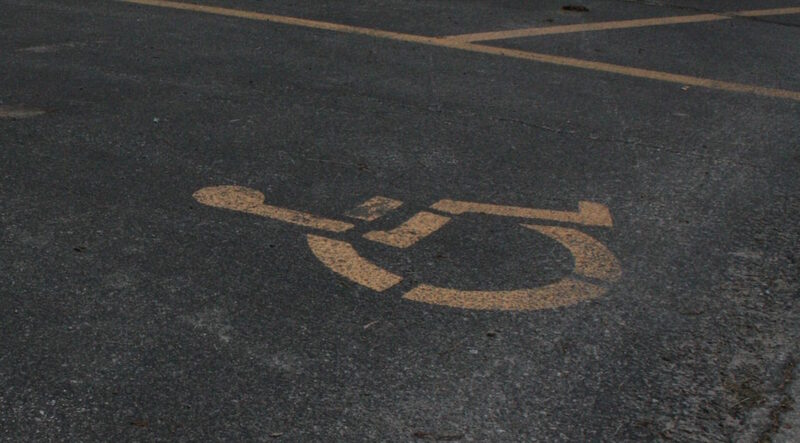 Markings for a handicapped-accessible parking space and a loading zone are shown outside a Cedar Rapids school on May 12, 2016. Data is grouped by school district as well as by school and is shown as total non-compliance citations as well as broken down into citations by areas of non-compliance. Since 2010, the Iowa Department of Education has inspected 48 school districts in the districts’ annual equity review, and all except one had areas of non-compliance with the ADA. The largest categories of non-compliance were parking and passenger loading zones, with a combined 336 citations, followed by toilet rooms with 157 and entrances with 122. After districts have 45 calendar days to return a compliance plan after receiving letters of findings citing issues found during equity reviews. Compliance plans must describe areas of non-compliance, remedies to correct the non-compliance, evidence needed to verify the remedy, the staff member responsible for overseeing the correction and a timeline for completion. Staci Hupp, the Iowa Department of Education’s communications director, said the department makes on-site visits to monitor progress until the areas of non-compliance are fixed. The federal Americans with Disabilities Act is intended to help people access public facilities, but an IowaWatch investigation shows most of our schools are not in compliance with the law.